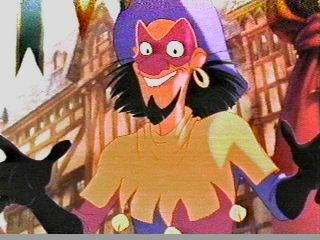 Clopin, the King of the Gypsies! Clopin is wonderful! He's silly, wacky, and he knows how to party! Well, he does host an entire festival by himself! But why exactly do we love him? For one thing, he's attractive! How could you not love a guy who looks so cute in tights? He has adorably cute hair, and that puppet-WOW! *puddles of drool begin leaking out of M&T's mouths* Hehe, sorry. The King of the Gypsies is here!! 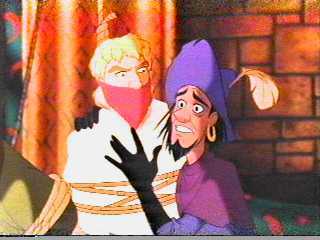 We've caught him in some of his weirdest moments, so here, for your enjoyment--CLOPIN! In the Court of Miracles: "Marcelle, give me that camera!" 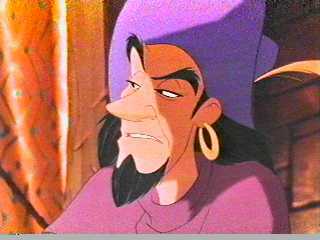 Clopin shouts. Marcelle throws the camera to Tealin. "Don't let him have it!" Tealin and Marcelle run out of the Court of Miracles with the camera and film still intact. Three days later, they're looking at the developed pictures. "Good grief! What's his problem?" gasps Tealin. "I don't know, and I think I'm afraid to know," says Marcelle. "Oh, he's so cute when he's angry!" giggles Marcelle. 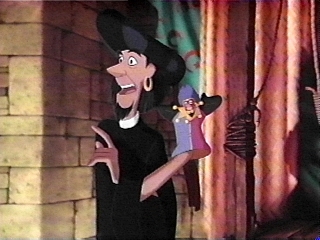 "Was that when you threatened to throw his sorry hide to Frollo?" "Yes, it was, Tealin." "Oh, Tealin, it's so cute when he talks to Puppet about you!" "I think the caption on that is, Did she really say that?" I got my pictures from Irea and Mirage! Their sites are listed below. Or go to these other sites: La Page De Clopin, Mr. Jester's page, The Court of Miracles, Clopin's Gypsy Band, Irea's site, Mirage's site, and Clopin's Tribe.